In many ways, having a farm in Carnation but living in Seattle is perfect. All our friends, our family, our customers live in the city, and I’d like to think that the fact that we grew up here (Garfield HS!) and live here enables us to make a connection with our customers that other farmers can’t. The worst part about living in the city is coming home after spending days on the farm and finding nothing in the fridge but spoiled milk and rotting vegetables. In the springtime, before we begin going to markets we spend nearly every night in our little trailer on the farm. The rare evening we do spend in the city is fraught with cooking distress, because our cupboards, refrigerator, and pantry are bare. But once the market season begins, life is great. 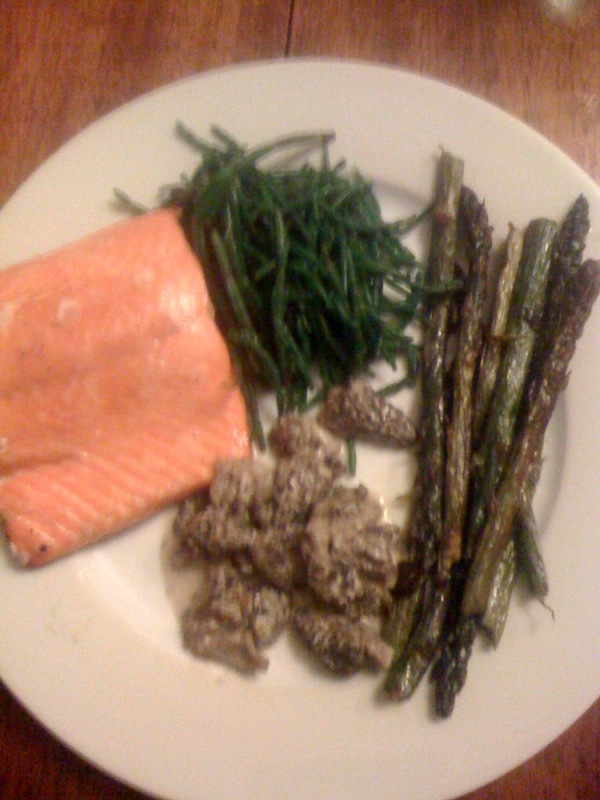 For instance, as the Broadway Sunday Market was closing yesterday, I traded unsold veggies for sockeye salmon from Loki Fish Co., morel mushrooms from Foraged and Found, asparagus from Alvarez Farms, perfectly ripe (finally!) strawberries from Hayton Farms, amazing walnut bread from Columbia City Bakery, and cheese from both Mt Townsend Creamery and Willapa Hills. Our friends Megan and John came over and we had a feast. I have to admit, four years into this boom and bust lifestyle, my perspective on food, food quality, and pricing has gotten totally out of whack. If you were to add up the value of all the food we got for free, it would have approached $100. For the most part, I believe the barter system at the market is a win-win for all involved. We certainly couldn’t afford to eat as well as we do, and I suspect other vendors feel the same. We are flush with perishable vegetables, other vendors are flush with perishable cheese, bread, mushrooms, berries, etc. For the vendors with products that do keep, they get the pick of the litter for their product because they can afford to be picky. Every vendor at the market eats better, essentially for free. When things are fresh, and ripe, and in season, and done well though, it is so good. With that in mind, here’s a recipe we’ve been enjoying a lot recently. We are using an unbelievably sweet variety of bronze romaine called brown golding and, unfortunately, it’s now the only lettuce we think worth making this dish with… other varieties simply don’t compare…..
1. Cut heads of lettuce in half lengthwise, so each half is held together by the root end. 2. Coat the halves with olive oil, salt, pepper and, if you wish, lemon juice and/or anchovies. 3. Over a warm grill or on hot cast iron skillet, sear the lettuce, cut edge down until the edge begins to brown and darken. Do not burn the lettuce, it smells terrible. Once the heart has begun to brown, flip the head over to just wilt the leaves. 4. Arrange on a plate and dress with balsamic vinegar and shaved parmesan. Since I started farming I can say I have had the same experience with foods that are not what I have come accustomed to. I found when I left Local roots and had to start buying food again I was so appalled at what I had to choose from at the grocery. Old limited choices and just plain bad produce. Thank the Lord I am back too farming and eating all the bounty I can grow. At the end of the day I know what you are talking about.